We're delighted to be supporting Operation Christmas Child, organised by international relief and development organisation, Samaritan's Purse UK. 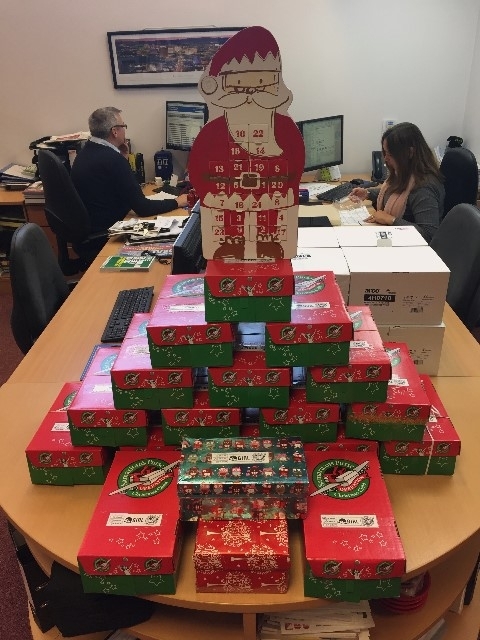 Our team has donated a range of toys, school supplies and toiletries to fill 19 shoeboxes that will be gifted to children in need around the world this Christmas. Our shoeboxes have been delivered to our local drop off centre in the hope of bringing some joy and cheer to the children that receive our gifts. Have you packed a shoebox for Operation Christmas Child this year? Make sure you deliver it to your local drop off point before Sunday 18th November 2017! Find your local drop off points on the Operation Christmas Child website, there are multiple in Banbury and the surround areas. Since launching in 1990, Operation Christmas Child has supported more than 146 million children in over 150 countries by sending shoeboxes full of gifts and amenities to children affected by war, poverty, natural disasters, famine and disease. Whilst only a small range of gifts, a shoebox can help be a part of changing children's lives all over the world. A simple shoebox filled with love can have a significant impact on a child and the local community. Keep update to date with how Operation Christmas Child, and Samaritan's Purse, is supporting children in need around the world by liking the Operation Christmas Child UK Facebook page or following @OOC_UK on Twitter. Thank you to all our team members who got involved in our support of Operation Christmas Child.